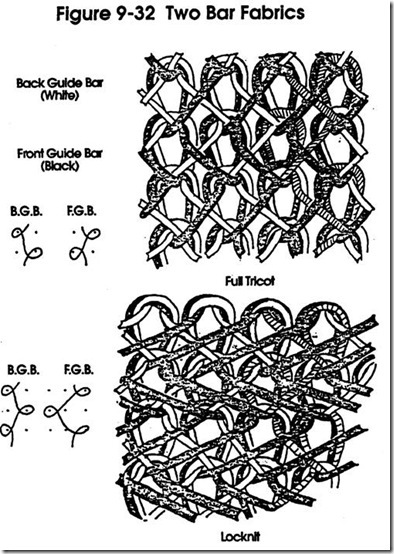 Have you ever wondered how knits are made? Well we've done all the research for you! 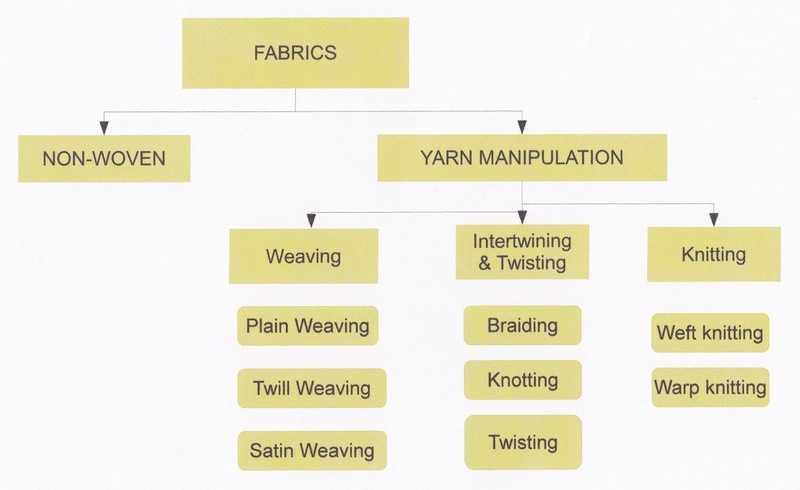 Learn a little bit about how knits are made and the different types. 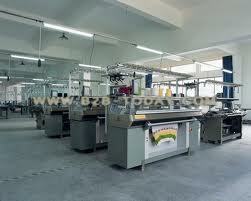 There are two methods used in producing fabric: Non-woven and Yarn Manipulation. 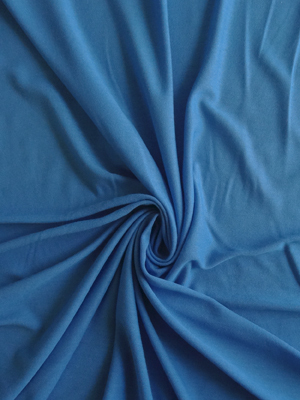 Non-woven includes felting, bonding and interlocking fibers. 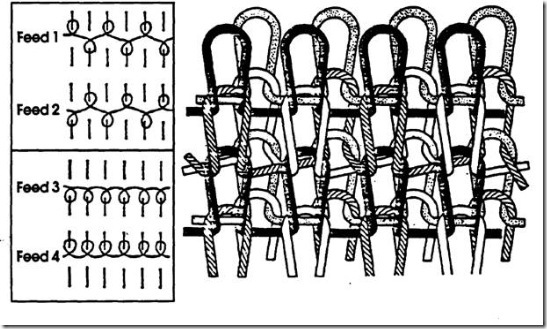 Yarn manipulation includes: weaving, intertwining & twisting, and knitting. Weaving and knitting are the most popular methods being used in fashion, decor, medical, aviation, transportation and more. Knitting is a fabric production method done by drawing a yarn with a needle or hook needle into a loop from a previously done loop. (Just like if you were knitting yourself!) 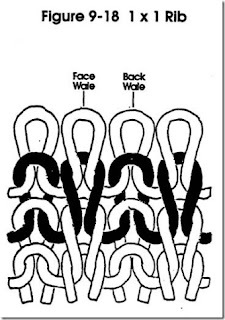 The smallest unit of a knit is a loop or stitch. 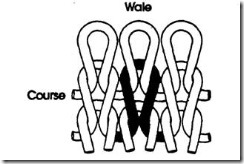 A row of loops running selvedge to selvedge are called Course and a column of loops running with the selvedge are called Wale. Knitted fabrics are divided into two different types: Warp Knitting such as tricot and Weft Knitted fabrics like jersey. 1. Warp Knitting: This type of knitting involves the drawn loops run with the selvedge along the length of the fabric. The warp yarns are prepared on beams. Milanese, raschel and tricot are warp knits. 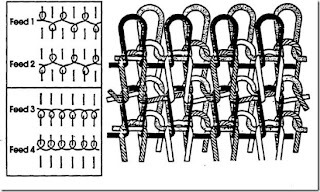 Milanese Knitting: Warp knitting with a diagonal rib. Run-resistant. Raschel Knitting: Can be made with intricate eyelet, lacy patterns, plain or jacquard patterns. Raschel knit fabric is coarser than other warp knit fabrics. Tricot Knitting: Can be made with either single or double sets of yarns. Run-resistant. 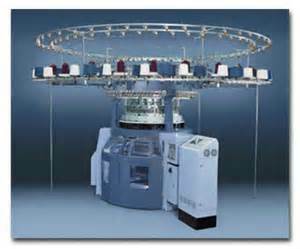 Circular Knitting: The fabric is knitted in the form of a tube in a circular machine, the threads run around the fabric. 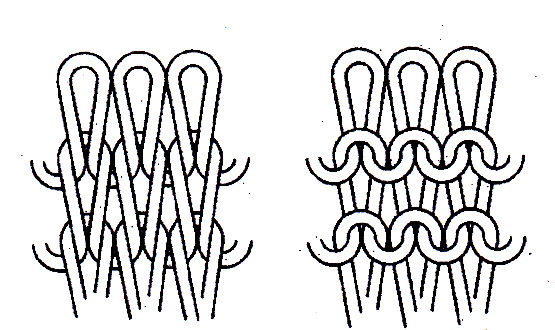 Flat Knitting: The fabric is knitted in a flat machine, the threads alternating back and forth across the fabric. 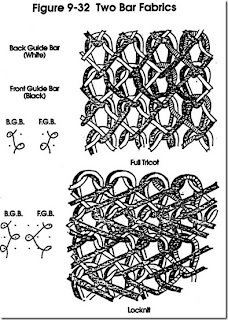 Weft Knitting fabrics include jersey and double-jersey (known as double-knit). 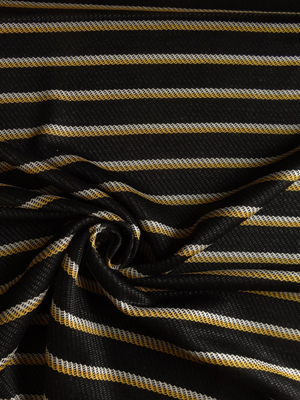 Jersey Knit: Flat knit fabric are made with loops drawn from back to front, the face looks uniform, loops running in a course and wales with no interruptions. The ends curls up. The back of jersey looks like having wavy, fine ribs running selvedge to selvedge. 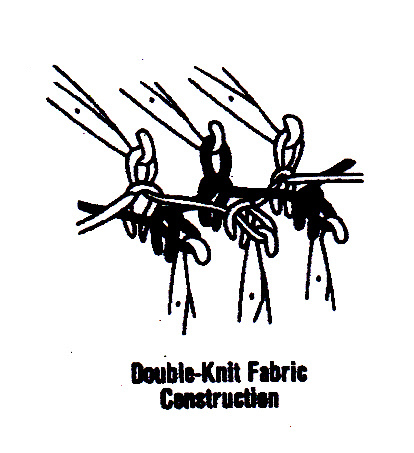 Double Knit: This type of knit is made from two layers of loops that cannot be separated. 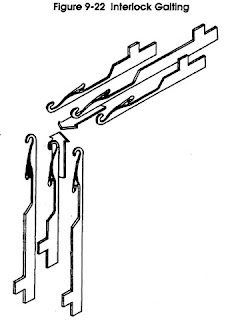 A double knit machine, which has two complete sets of needles, is required for this construction. 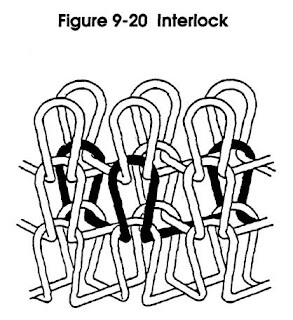 The is made by needles drawing loops vertically and horizontally in each stitch. Rib Knit: This is a type of double-knit fabric with wales alternately on the face and back. Odd wales on one side of the cloth and even wales on the back, making it look the same on both sides. 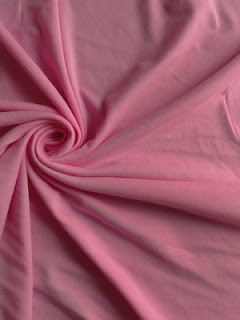 It does not curl on the edges and have good elasticity selvedge to selvedge. 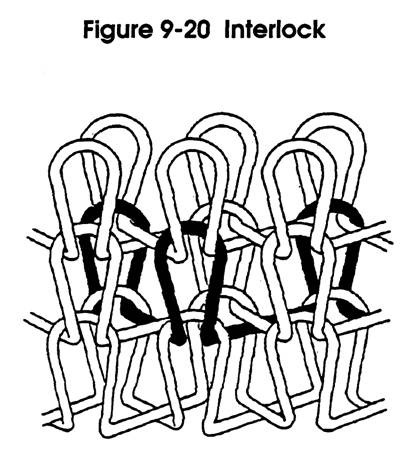 Interlock Knit: This type of knit is a variation of a 1x1 rib knit with flat and stable characteristics. 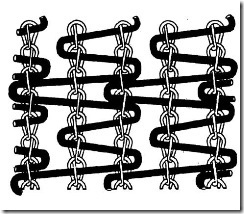 It is not as flexible crosswise as a rib knit is. Ponte di Roma or Ponte Knit: This is another example of a double knit. 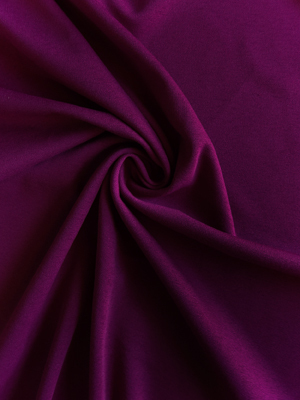 The fabric is plain, looks the same on both sides and has flat, fine crosswise ribs. Ponti means bridge, full name would be Roman Bridge. 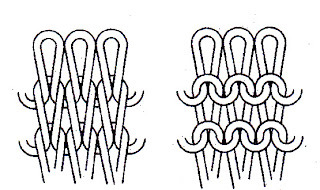 The small units of double-stitches resembles a bridge. Ponte Knit is a versatile fabric, semi-flowy, light to medium, medium or even medium to heavy weight, suitable for working 3D designs on the apparel. 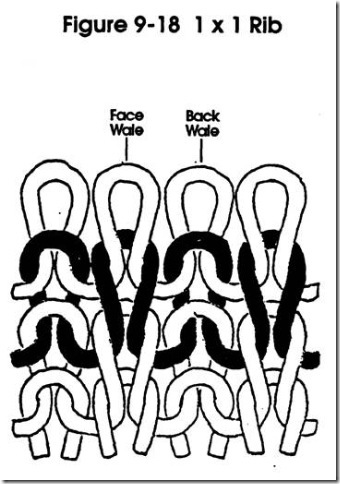 Pique Knit: Worked with stitches that raised cords in the warp direction, could be medium weight to heavyweight. Information adapted from Textiles Technology. What I would like to know is how to purchase knits with confidence. I get the different kinds of knits but there are so many different weights and I would like to be able to compare weights. Right now the information is usually light, medium or heavy weight. I imagine there is a huge range in "medium weight" fabric. Thank you for your comment! We will bring it up in our meeting about possibly doing an additional post to cover this topic. 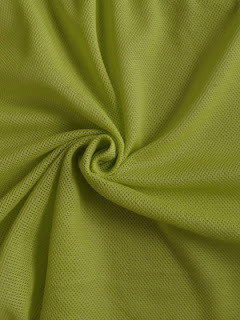 In the meantime, if you are planning on ordering fabric from Fabric Mart, you are welcome to call us and ask us questions about the knit you are looking at online. 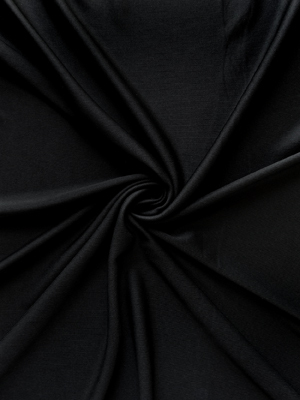 We understand that it is difficult to know if a fabric is right for your project when you can't see and feel it. And due to how quickly our fabric sells out, we do not offer samples. Please call us if you are unsure about our description. Great information. I was wondering if you could expand this to explain ITY knits. There are a lot of these for sale on your website, and I'm never sure what this means. Thanks. Thank you for your suggestion! 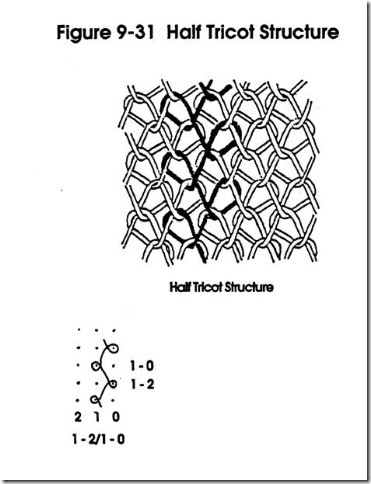 We actually have a post planned to explain ITY knits and show you what to make with them. Keep checking back to see the post sometime in May! Did you hear the bad news? Julie's Picks Contest Submission Begins!